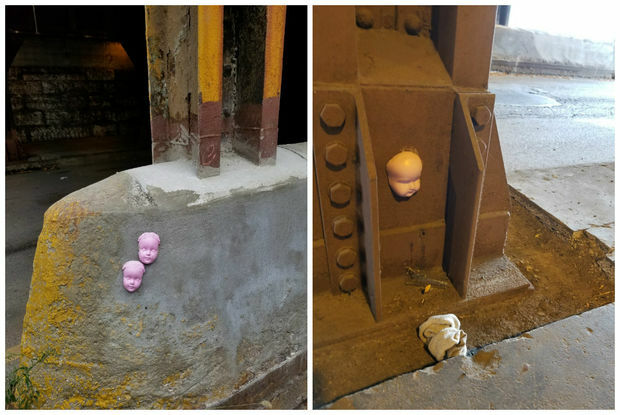 Doll heads have been spotted in the 1200 block of West Augusta Boulevard and on a concrete barrier by the Armitage Avenue Kennedy Expy. exit. WEST TOWN — Doll heads have been spotted on West Augusta Boulevard in West Town and on a concrete barrier by the Armitage Avenue Kennedy Expy. exit in Bucktown, a DNAinfo reader said. "I'm legitimately concerned by the multiplying doll heads tacked up around Wicker Park and Bucktown," Andrea Cordts wrote. Cordts, a public relations account manager, said she first spotted the doll heads near Fetch PR's office at 1250 W. Augusta Blvd. early last week and did not think it was more than an isolated incident. But Friday morning, Cordts said she also noticed doll heads on the concrete barrier by the Kennedy's Armitage exit, several blocks from where she saw the first doll heads. "This is some super weird street art, and I was wondering if you knew what was going on," Cordts wrote. On Tuesday, Cordts said she noticed the doll heads near her office were still there. In full disclosure, the cold and rainy weather has kept this usually beat-focused reporter off the streets the last few days, so notmuch IRL doll head-spotting was conducted. But pages and pages of terrifying doll heads were spotted on Instagram.